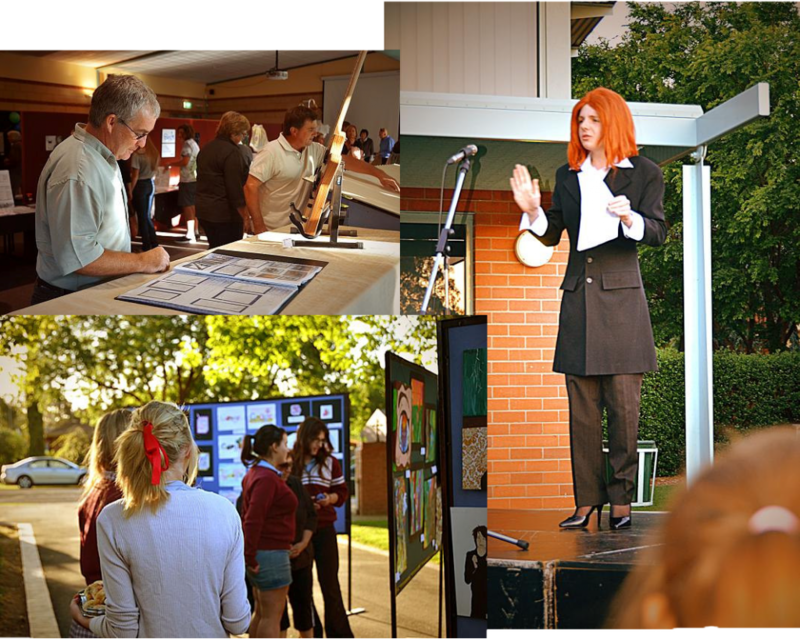 On Tuesday the 18th of October, Galen Visual and Performing Arts students, along with the Technology students, wowed the attending audience at the Opening of the Arts and Technology Exhibition. appreciative of the wonderful talent on display. As the crowd entered the Phillipson St entrance, there were wonderful artistic exhibits from Year 7 to 10 lined along the footpath. Inside the auditorium the VCE Arts, Food, Media, Technology (Wood) and Visual Communications students were responsible for displaying both their finished products and folios. During the Opening Ceremony, three VCE drama students presented their Solo piece. Elaine Brown- Graham with all her service and dedication to the school was an excellent choice for the Guest Speaker. A surprise visit from our very own Julia Gillard (Jesse Sanderson) ensured that the opening ended on a very entertaining note. Beautiful food and punch added greatly to the ambience of the night. Thank-you to all who attended and to the staff for their continued professionalism and support of their students.